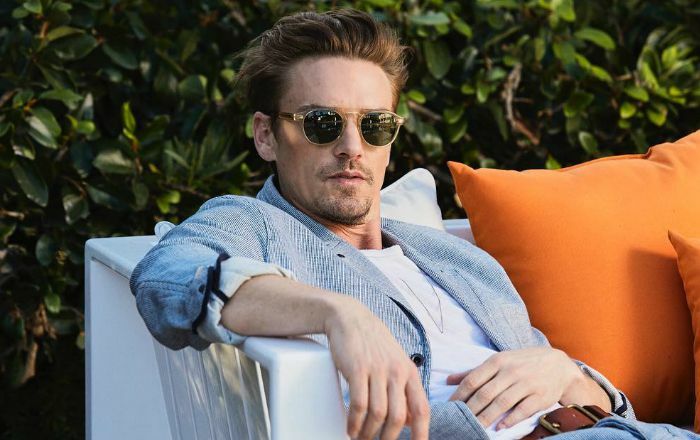 American actor Riley Smith who is remembered for his starring roles on the television series Drive and Frequency, and recurring roles in the series 24, Joan of Arcadia, 90210, True Blood, Nashville, and The Messengers. Riley Smith was born on the 12th of April 1978, in Cedar Rapids, Iowa, United States of America. He’s currently 41 years old. Place of Birth Cedar Rapids, Iowa, U.S.
Riley Smith graduated from Alburnett Junior-Senior High School in 1997. He was an accomplished horse rider and thought of earning a college degree to complement his Equine interests, but fate other ideas. He was discovered by a local talent scout and subsequently entered into the modeling world. Riley is currently in relationship with Nazanin Boniadi. He dated Danneel Ackles in the past. In 1999, Riley Smith made his onscreen acting debut in the film Lovers Lane where he played the role of Michael Lamson. Since that, he has appeared in a number of films such as Eight Legged Freaks, Not Another Teen Movie, Radio, New York Minute, Bring It On and Weapons, to name a few. In 1998, he appeared in an episode of the TV series One Word which marked his television debut. His recurring roles in the series Freaks and Geeks, Raising Dad, 24, Joan of Arcadia, 90210, True Blood, The Messengers, Nashville and Life Sentence. Also his starring roles in Disney’s Motocrossed, Drive and Frequency. He did several modeling assignments including Tommy Hilfiger campaign before trying his luck in Television and films. Smith has an estimated net worth of more than $1 million US dollars as of 2018. Just over here waiting on Christmas. He was raised in his parents horse ranch in Marion, Iowa. He became an accomplished horseman when he was 9 years old, and at 15, he placed 4th in 3-Year-Old Mares division at the American Quarter Horse Youth World Championship. At 16, he won the American Quarter Horse Youth World Championship and at 17 became president of the 50,000-member youth association, becoming the youngest person to serve as president of American Quarter Horse Youth Association. He was discovered by a local talent scout at the Westdale Mall in Cedar Rapids and eventually attended the 1997 International Modeling and Talent Association (IMTA) convention in New York. He was there signed by Tommy Hilfiger for their modeling campaign. His big break in TV came when he appeared in six episodes of Fox’s 24 in 2003. Smith played Russ, the love interest of Mary Elizabeth Winstead’s character in the dancing film Make It Happen. He’s the lead vocalist and guitarist of the band “The life of Riley”. In 2005, he won the CAMIE Award for his performance in the film Radio.